Stanley Cooper's family attended a Justice Department ceremony honoring the slain court officer. Stanley Cooper had guarded the Las Vegas federal courthouse for nearly two decades when a gunman stormed into the building and fatally shot him. But when his family applied for the benefits the federal government promises to law enforcement officers killed in the line of duty, they were denied. Five years later, they are still battling the government for more than $300,000 in death benefits -- the amount given to other survivors. Under federal law, the Department of Justice grants death benefits to "recognize the ultimate sacrifice of law enforcement officers, firefighters and other first responders killed in the line of duty" (from local law enforcement to federal officers) and to help their families deal with the financial shock of losing a loved one. As a court security officer, Cooper was a deputized member of the U.S. Marshals Service. He carried a gun and had authority to make arrests. But because he worked for the federal government through a private contractor, the DOJ said that death benefits are off limits to his family. Cooper, back middle, with his family. This technicality means that the roughly 5,000 security officers that the U.S. Marshals hires through private contractors to guard federal courthouses are risking their lives every day with no promise of security for their family if they are tragically killed on the job. So are any other public safety workers who are employed by private contractors -- from firefighters to paramedics. And thanks to the DOJ's growing backlog of claims, even families of those who worked directly for the government must wait years before they learn whether they will receive benefits. A recent inspector general audit found "significant delays," reporting that it has taken more than a year -- sometimes more than two or three years -- for the agency to process at least 25% of death and disability claims. And multiple senators have called on the DOJ to expedite the claims. 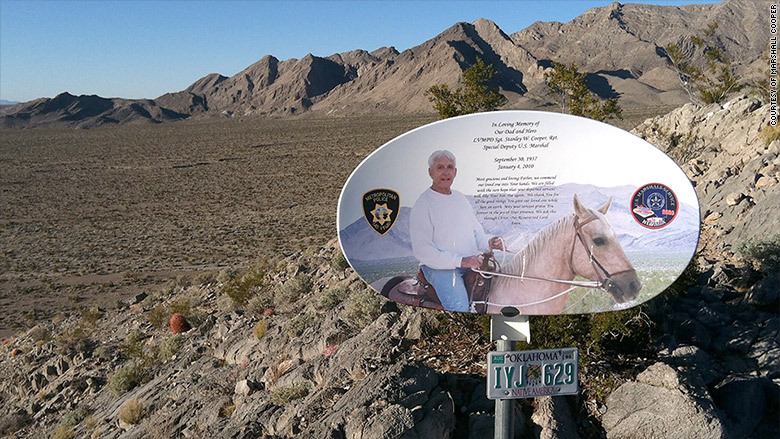 A memorial for Stanley Cooper at his beloved horse ranch in Nevada. 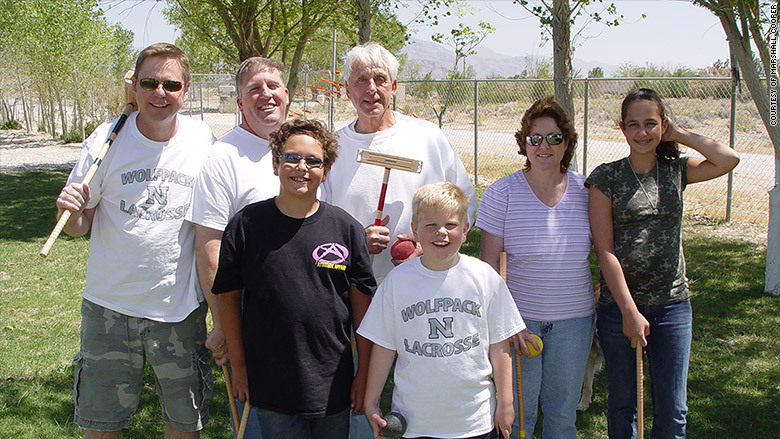 A retired Las Vegas police officer, Cooper loved working as a court security officer, says his son Marshall Cooper. Even at the age of 72, he had no plans to slow down. "He said he was just going to work until he couldn't work anymore," he said. When the gunman, Johnny Lee Wicks, opened fire at the courthouse one morning in January 2010, Marshall says his father's first instinct was to protect those around him -- shielding another employee from gunfire even after being shot himself. He was the only person other than the shooter, who was killed by return fire, to die that day. He left behind five children and seven grandchildren. 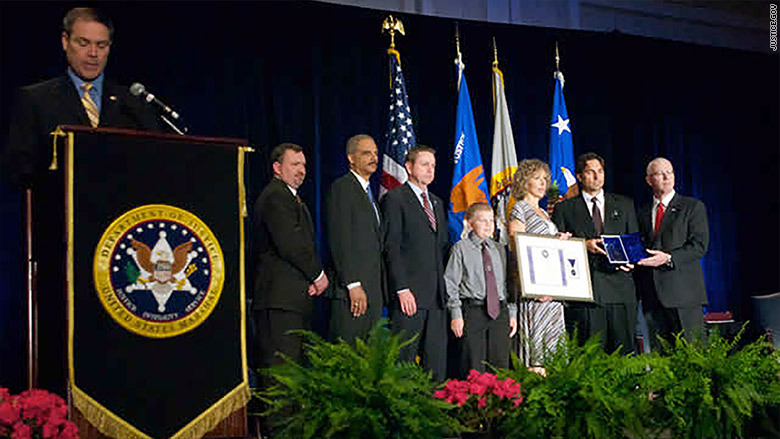 "We'll never know how many people he saved that winter morning, but we'll never forget the courage he showed that day -- and throughout his career," then-Attorney General Eric Holder said in April 2010 when Cooper was honored with a purple heart. Cooper's family says they received around $15,000 from Cooper's private employer. Government death benefits would be a formal recognition of his sacrifice, the family says. The money would also help them hold on to their father's beloved horse ranch. Cooper's father had requested in his will that the ranch stay in the family, but the cost of keeping it has been too much. Despite his heroism and the kind words, the Department of Justice hasn't budged on its position. It denied Cooper's death benefits for the second time in September. A DOJ spokesperson told CNNMoney the agency is simply following the law. Not all branches of the DOJ agree with its decision. The U.S. Marshals Service has argued that Cooper and other court security officers serve as public safety officers and should be eligible for death benefits. Lawmakers have taken up the cause as well. Senators Harry Reid and Dean Heller are sponsoring legislation that would allow security officers like Cooper to receive the same benefits given to other members of law enforcement. "Just because CSO Cooper was a contract employee does not change the fact that he paid the ultimate price in order to save the lives of others," said a spokesperson for Senator Reid. "His family should be compensated."